Situated along the coast of northeastern Japan, the town of Rikuzentakata once had a seemingly peaceful seascape, including pine trees and white-sand beaches. 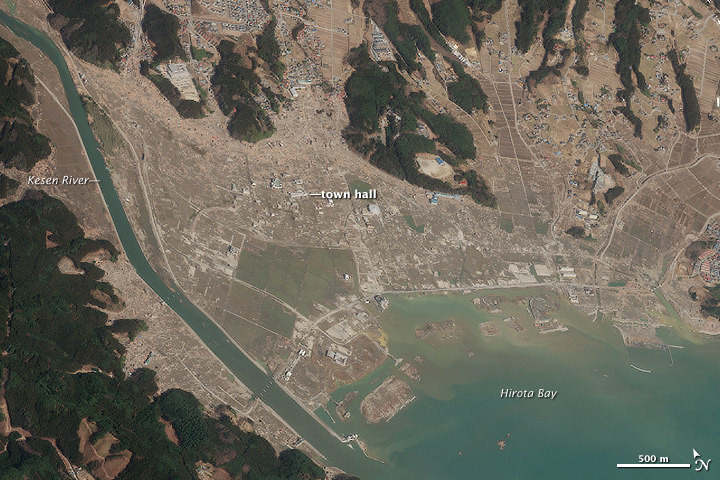 But on March 11, 2011, a tsunami wave traveling up Hirota Bay reduced the town of 23,000 residents to rubble. 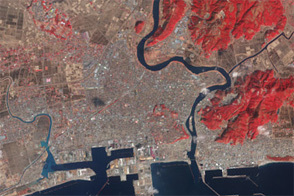 This natural-color image from the WorldView-2 satellite shows Rikuzentakata three days later, on March 14. More than two centuries ago, settlers planted more than 60,000 trees along the beach to protect inland fields from salt and sand. After the 2011 tsunami, a lone pine tree survived and became a symbol of hope to Rikuzentakata residents. By February 2012, however, the tree was dying, slowly poisoned by salt water in the soil. According to a news report from December 2011, the estimated damage to Rikuzentakata totaled $1.5 billion. But the positive signs of recovery were also popping up. Construction on emergency housing began within days of the tsunami, and a new solar-powered city hall opened in June 2011. By December 2011, the city had established a clinic and many small businesses had reopened. 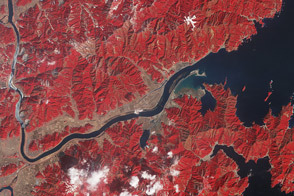 Image by Robert Simmon, using data ©2011 DigitalGlobe. Caption by Michon Scott. 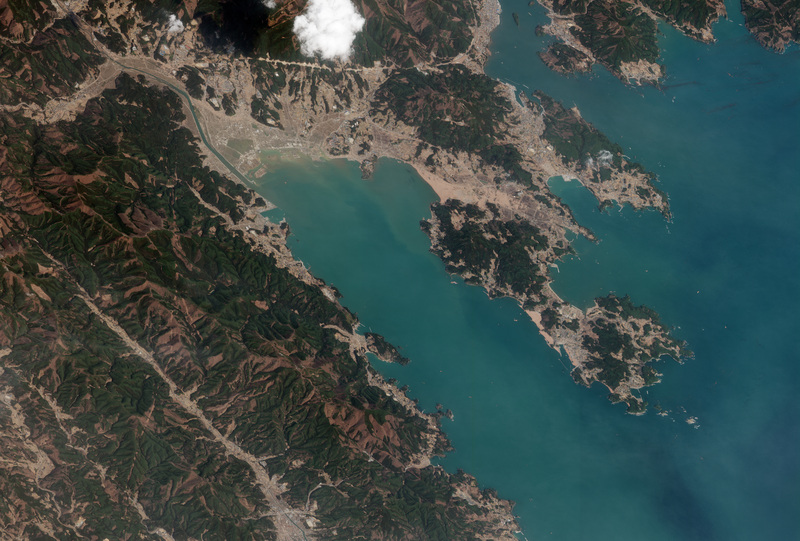 Acquired just three days after the Tohoku earthquake, this natural-color image shows the remains of a town that was nearly erased by the 2011 tsunami. Blake, L. (2011, December 12). In Japan, life-support for tsunami-torn town. JapanRealTime. Wall Street Journal. Accessed March 7, 2012. National Public Radio. (2011, April 1). “Tree of hope” stands as poignant symbol in Japan. Accessed March 7, 2012. Reuters. 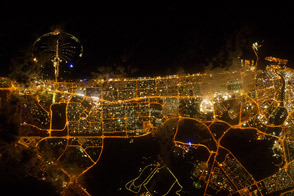 (2012, February 23). Hope fades for lone pine tree survivor of tsunami. The Asahi Shimbun. Accessed March 7, 2012. Staff. (2011, March 19). Temporary housing construction begins in quake-stricken areas. The Asahi Shimbun. Accessed March 7, 2012.